Humans are great at seeing patterns in things when, in fact, they don’t exist. There are between 20 and 40 volcanoes erupting at any given day. Every now and then, volcanic eruptions make the headlines more often. All of a sudden volcanic activity is perceived to be on the up, when it’s not. The same applies to earthquakes. A quick scan of the headlines this morning suggests that the Ring of Fire is shaking so uncontrollably that the “Big One” is imminent. Spoiler alert: The Ring of Fire isn’t what you think it is. Also, the Big One isn’t imminent, these earthquakes are unrelated, and the area is doing exactly what it’s supposed to. Let’s tackle these in that order. First, the Ring of Fire, also named the Circum-Pacific Belt by scientific hipsters, is the seismically and volcanologically active zone, marked by multiple tectonic plate boundaries, that surrounds the massive Pacific Ocean. According to the United States Geological Survey (USGS), about 90 percent of the world’s earthquakes happen there. About 75 percent of the world’s volcanoes can be found here too. These earthquakes are complicated, as are the volcanic eruptions that take place there. The tectonic plate boundaries aren’t all born equal: plenty are subduction zones, where one plate descends beneath another, which creates both explosive volcanoes at the surface and sometimes extremely powerful tremors. Others, like the San Andreas Fault, involve plates sliding against each other in opposite directions. They all behave and move differently, which means quakes happen at varying magnitudes and at different times, all the time. 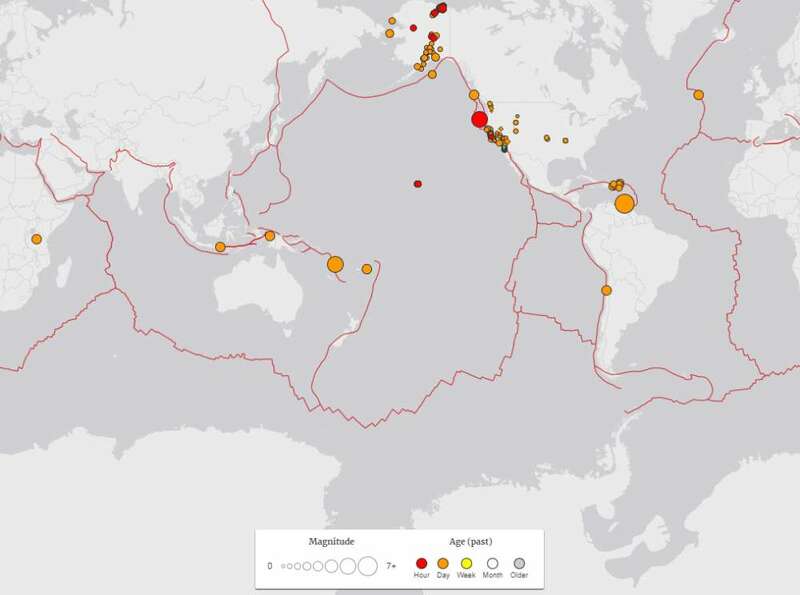 According to this useful earthquake tracker, which mines USGS data, there have been 146 earthquakes around the world in the past 24 hours with a magnitude of 1.5 or greater. Multiple occurred in California. There’s nothing weird about any of this. Seismic events on the Ring of Fire are exactly what you should expect. Per Discover, it's a fairly colloquial descriptor anyway. It’s not really of any geological use, because what happens on one boundary or fault doesn’t affect another all the way across the truly colossal Pacific Ocean.